Pd oxide reduces with X-ray exposure. Acquire Pd3d region before all others, if possible. Minimize acquisition time for Pd3d region. Pd3d region has well separated spin-orbit components (Δ=5.26 eV). Pd3d peaks have asymmetric peak shape for metal. 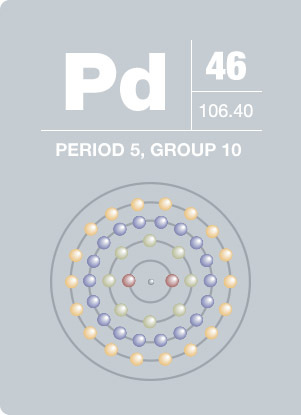 Pd oxides has symmetric peak shapes. Direct overlap between Pd3p3/2 and O1s peaks. Use Pd3p1/2, which does not overlap with O1s, as a guide for any peak fitting. Intensity and binding energy of Pd3p3/2 peak is set by the Pd3p1/2 peak, according to the spin-orbit splitting and ratio. Remainder of intensity under at Pd3d5/2 energy can then be attributed to oxygen. Primarily used as an industrial catalyst and in jewelry, palladium is a rare silver-white transition metal similar to platinum. Some notable features of palla- dium include its tarnish resistance, low density and melting point, and its chemical attraction to sulfuric and nitric acid. When dissolved in hydrochloric acid, palladium absorbs up to 900 times its own volume of hydrogen at room temperature. In 1803, palladium was first discovered in crude platinum ore from South America by W. H. Wollaston. Palladium was named after the asteroid Pallas, which was discovered two years prior to the element’s discovery. Palladium is commercially produced from nickel-copper deposits. The element can be found as a free metal and alloyed within platinum and gold in deposits located in Ethiopia, South and North America and the Ural Mountains.